Powers/Abilities/Functions: None. The Master Form was touted as an object of great value and those who held it were instructed to protect it with their lives. Its protectors did often end up sacrificing their lives for it. It seems to have actually just been a means to an end, drawing attention away from other activities, or occupying a group of people for some purpose. History: The origins of the Master Form are unknown. (Wolverine II#29 (fb)) - Merrick and his agents brought the Master Form to the parents of Ted and instructed them to guard it with their lives. One night soldiers stormed the streets of their neighborhood and blew up Ted's, killing his parents, and then slaughtered the rest of the neighborhood. Ted and his cousin Ricky escaped with the Master Form and met up with Merrick when he arrived. Merrick was grateful that the Master Form had been saved, and he offered Ted and Ricky the chance to be trained so that they could one day avenge their parents. (Wolverine II#27 (fb ) - BTS) - Perhaps five or ten years later, the Broker arranged to have the Master Form entrusted to the people of Rumika in order to secure the Lazarus Project, a venture involving General Coy of Madripoor. (Wolverine II#27) - Merrick and Target (formerly Ted) brought the Master Form to Rumika and met with the town leader, who agreed to take it into the city, vowing that his people would die to protect the secret of the Master Form if need be. (Wolverine II#28) - Soldiers swarmed over Rumika, slaughtering its natives to the man. Wolverine, who had lost his memory and had been living amongst the Rumikans, recovered his memory too late to save the people of Rumika, but not too late to save them. Karma learned of the slaughter and traveled to Rumika, but was also too late. 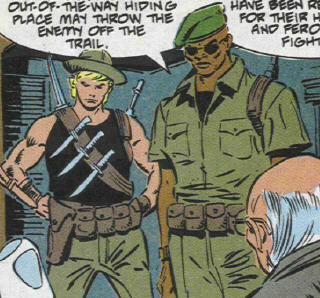 When Merrick and Target arrived to investigate, Wolverine recognized Merrick's scent and revealed that he had sent the soldiers to slaughter the Rumikans. Realizing that Merrick must have also led the soldiers that slaughtered his own parents, Target killed Merrick. (Wolverine II#29) - Wolverine decided that since the people of Rumika had died protecting what the Master Form represented, that they should keep it. He, Karma, and Target left the Master Form on the sand next to the villagers' massive funeral pyre. (Wolverine II#30 - BTS) - The Broker's agents investigated the disappearance of those sent to slaughter the Rumikans, as well as the first group sent to check on them. They were astonished to find the Master Form abandoned on the sand. Not wishing to leave any trace that any of his people had ever been to Rumika, the Broker instructed his agents to leave the Master Form where it lay, and to return to Madripoor. Comments: Created by Jo Duffy and John Buscema. Let me know if you think I completely missed the boat with the Master Form's (and the Lazarus Project's) purpose. I keep looking for Wolverine#30.5 to explain the whole deal, but can't seem to find it. any other "Master" characters, items, etc. An enigmatic individual, who ran a business known as Andover Enterprises, which apparently employed Hikaru and Genji. He was employed by General Nguyen Ngoc Coy to keep the Lazarus Project secure. He apparently used the Master Form to draw attention from his other operations, and he was likely involved with its previous use under the guard of Ted and Ricky's parents. He is likely the one who came up with the idea of promoting the idea of the Master Form as an object on unimaginable value. 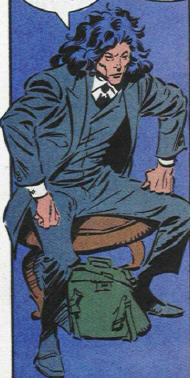 It was the Broker who first made the connection between Patch and Wolverine. When things began to turn sour, the Broker hid out amongst the dead and then escaped by helicopter when the coast was clear. I'm not certain how closely he was actually connected with the Lazarus Project. Hikaru and Genji were two of the Broker's agents. When Wolverine stormed Prince Baran's castle, they committed suicide rather than face his wrath. An enigmatic Project funded by General Coy with an uncertain goal (possibly eternal life or resurrection of some sort, given the name. Taking Pinocchio as the chief accomplishment of the project, it may mean that they were doing so by either transferring minds into robotic bodies, or by creating cyborgs). The chief scientist of the Lazarus Project was Dr. Page. The Master Form was used to force the people of Rumika to defend it with their lives, which in some way secured the Project from disruption. Pinocchio was the primary test subject for the Project. With the capture of Dr. Page and the subsequent flight of the Broker, the Lazarus Project apparently came to a halt. A mercenary soldier (with the rank of Captain) in the employ of General Coy (and presumably the Broker), it was Merrick who delivered the Master Form to those who were to protect it, and convinced them to defend it all costs. It was also Merrick that then sent the troops to slaughter the Master Form's defenders, although why he did this, except possibly as a distraction from other activities of his employers, is uncertain. He convinced Ted and Ricky to train under and eventually work for him in order to avenge their parents' killers. When Target learned that he had been the one to send the troops that killed his parents, Target killed Merrick. The mad scientist heading the research of the Lazarus Project. She designed Pinocchio, whom she used as her protector/enforcer. She also designed a chemical that caused amnesia (which proved to be temporary in Wolverine's case, but he may be unique in that respect). When the heroes broke her control over Pinocchio, she tried to destroy his brain, but Wolverine stopped her--without killing her. Ricky was the cousin of Ted, and lived with his aunt and uncle. Along with Ted, he was the sole survivor of the slaughter when the soldiers came for the Master Form. Ted and Ricky agreed to train under Merrick, but Ricky found that he didn't really excel in any particular field, while Ted proved to be an expert marksman. Wishing to prove his worth, Ricky volunteered for the Lazarus Project, where Dr. Page transformed him into Pinocchio. 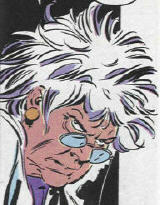 When Jessica Drew investigated the Lazarus Project, Dr. Page had Pinocchio beat her senseless and dump her out on the streets. Wolverine came to investigate what had happened to Jessica and he, too, fought Pinocchio. In mid-battle, she hurled a chemical into Wolverine's face, which caused his memory to fade and he fled. Later, Wolverine (his memory now recovered), returned alongside Karma and Target. Wolverine prepared to go medieval on Pinocchio, but Target somehow recognized him as his cousin and managed to reach Ricky's mind, stopping the fight. Enraged, Dr. Page tried to use her controls to destroy Ricky's mind, but Wolverine stopped her. 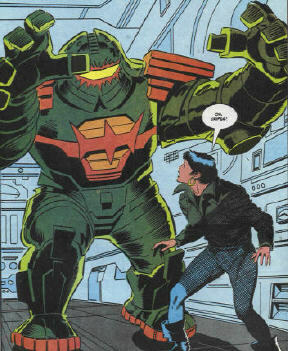 Pinocchio was a large and powerful mechanical creatures, either a cyborg, or a robot with the mind of Ricky. It was superhumanly strong (Class 10 or less) and composed on an indeterminate metal, which could repair itself almost instantly, sealing large gouges in seconds. It also had bladed weapons on its wrists. While it did have Ricky's brain (or mind) it was subject to the remote control device of Dr. Page. An island nation off of the Southwest Coast of Madripoor. The leader of the people of Rumika agreed to guard the Master Form with their lives--which they did to the very man. 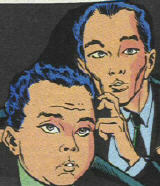 Jian and Lum were named in Wolverin#28. Ted was the cousin of Ricky. Along with Ricky, he was the sole survivor of the slaughter of his neighborhood (including his parents) when the soldiers came for the Master Form. Ted and Ricky agreed to train under Merrick, but Ted proved to be an expert marksman. He received the name Target and ended up working alongside of Merrick himself. He accompanied Merrick in bringing the Master Form to Rumika, but when he learned that Merrick was responsible for sending the soldiers that killed the holders of the Master Form (and thus his parents), he killed Merrick. He then joined with Wolverine and Karma in killing the soldiers who arrived to follow up on the slaughter of the village. 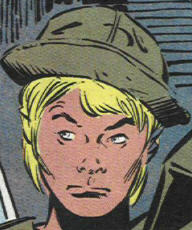 He also followed them to Madripoor, where he recognized the robot Pinocchio as his long lost cousin, Ricky. This effectively stopped the fight. Afterwards, Ted hoped he could find some sort of owner's manual to try to find out what had been done to Ricky. Target was an extremely skilled marksman and was proficient with the use of most types of guns and knives. Ricky had always said Ted threw like a girl, but Ted always responded that Ricky was the only to have ever said that.